California killifish, captured from Zuma Creek Lagoon, Los Angeles County, CA on 26 January 2006. Photo by Steve Howard. 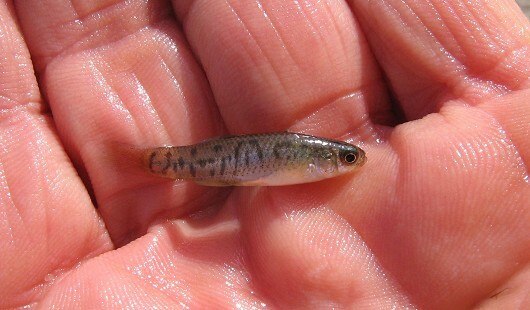 California Killifish are primarily found among beds of aquatic vegetation in shallow lagoons and estuaries. Though they usually inhabit brackish water, Killifish can withstand salinities ranging from 0 to 128 ppt. In addition they can tolerate pollution, changes in dissolved oxygen, and temperatures ranging from 11-25°C. Large Killifish are more adaptable to changes in oxygen levels, whereas smaller fish adjust better to changes in salinity. They may be found in freshwater as far as 1-2 kilometers upstream, and have the ability to complete their entire lifecycle in freshwater. In bays or estuaries Killifish form loose shoals and follow the changes in tide. They feed mostly on planktonic and benthic invertebrates with major food sources varying with location and time. Fish living near tidal flood zones feed on a diverse group of organisms and tend to feed at high tide. In comparison, Killifish not living in these zones have limited feeding options. Most California Killifish have a one year life history and reach full adult size in 6-7 months. Some adults reach an age of 2-3 years. Peak breeding occurs from May through June, sometimes starting earlier and lasting longer. Female Killifish lay their eggs over a period of weeks or months, usually in pools found on tidal flats. They lay approximately 60-440 eggs that adhere to aquatic vegetation for the incubation phase. 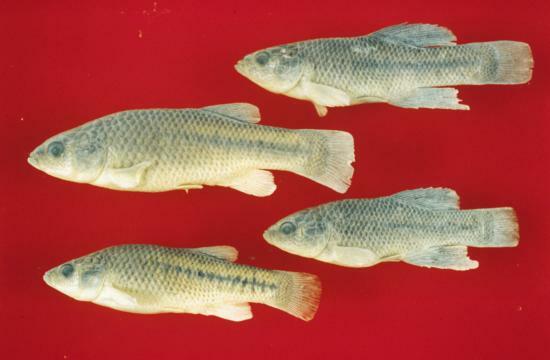 Most adult Killifish perish after breeding.